Babies are so precious and full of love and smiles, we want to make sure that they are always safe. In the first few months, your newborn will probably sleep for a very long time (about 16 hours a day), not counting the feeding and snuggling time. 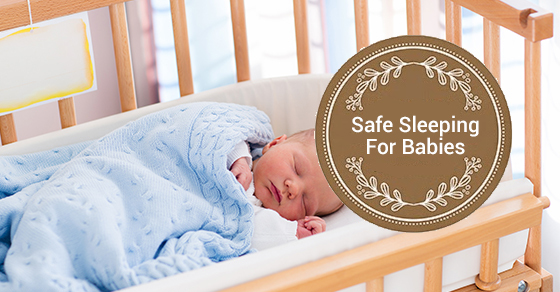 In order to keep your baby safe and secure while they sleep, here are a few things to keep in mind. When selecting a bassinet for your baby, check that it meets the current Canadian safety regulations. As well, please ensure that you only let the baby sleep in the bassinet until they can roll over or until they reach the maximum weight that the manufacturer suggests. When your baby hits either of these landmarks, it is time to upgrade their sleeping arrangements to a crib or cradle. When selecting a crib for your baby, please again make sure to check that it meets the current Canadian safety regulations. When your baby reaches the maximum weight suggested by the manufacturer or is able to push up on their knees and hands, they can be upgraded to a crib. When selecting a crib for your baby, please make sure that it meets the current Canadian safety regulations. When your child is able to climb out of the crib or taller than 90cm, they can be put in a standard or toddler bed. Cotton sheets and blankets are the best option for your baby – it helps to keep them at the right temperature. Generally, it is best to keep the room temperature between 16 and 20 degrees C.
You are not alone in worry about your baby’s sleep especially if you are a first-time parent, there are many very simple steps that can be taken to keep your baby safe. Make sure your baby is put to sleep on their back. Don’t let the room get too hot, check the thermostat. As recommended above, room sharing is good for your baby. Don’t use pillows, your baby needs to sleep on a firm and flat surface. Don’t let your baby sleep on the sofa. Do as much research as necessary to feel that you have a firm understanding of your baby’s safety, and for any further questions or concerns, our team of experts can offer you helpful guidance.